Is Microsoft Launching a Social Network? Is 2-Week-Old Google+ Nearing Critical Mass? Microsoft may have accidentally leaked an image of its own social networking platform. Called "Tulalip," the site is designed to enable users to "find what you need and share what you know easier than ever," according to the image of the site's homepage. Based on the one page, users would be able to sign into the site using their Facebook or their Twitter account. Microsoft did not respond to a request for comment on Tulalip or whether the company is getting ready to launch either a social network or a social search site associated with its Bing search engine. This news comes on the heels of Microsoft-competitor Google launching its own social network, Google+, two weeks ago. Late Thursday, Google CEO Larry Page announced that the company's fledgling site, which is still in field trials, already has gained more than 10 million users. 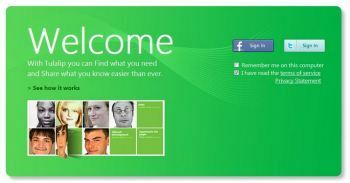 The site, a direct competitor to Facebook, is stirring up the social networking world with its quickly found momentum. Tulalip (pronounced Tuh-lay-lup) is the name for a group of native American tribes in Washington state. Microsoft is based in Redmond, Wash.
Sharon Gaudin covers the Internet and Web 2.0, emerging technologies, and desktop and laptop chips for Computerworld. Follow Sharon on Twitter at Twitter @sgaudin or subscribe to Sharon's RSS feed. Her e-mail address is sgaudin@computerworld.com. This story, "Is Microsoft Launching a Social Network?" was originally published by Computerworld.